Bracken Cave is the summer home to the largest colony of bats in the world. An estimated 20 million Mexican Free-tailed Bats roost in the cave from March to October making it the largest known concentration of mammals. The cave is located in southern Comal County, Texas, outside the city of San Antonio. The 100-foot-wide crescent shaped opening to the cave lies at the bottom of a sinkhole, formed when the roof of the cave collapsed. The cave and 1,521 undeveloped acres around it are owned by Austin, Texas-based Bat Conservation International, which restores the land to support native vegetation and an abundant variety of wildlife. Bat Conservation International bought the initial 697 acres from the Marbach family, and has been assisted in preservation efforts by The Nature Conservancy. Access to the cave is restricted to protect the habitat of the resident bats. Bat Conservation International offers evening guided tours to the cave to watch the bats emerge from the cave. Bracken Cave has been featured in the media several times since its discovery. National Geographic Wild HD channel included Bracken Cave in its World's Weirdest Series, Episode: Freaks of the Sky. It was also featured in the first pilot episode of Dirty Jobs. The Bracken Cave is the destination every March or April of over 20,000,000 Mexican Free-tailed bats (Tadarida brasiliensis). These bats fly as much as 1,000 miles from Mexico to this cave. After arriving in the cave, the migrant mothers give birth to pups. An astounding 500 pups have been recorded clinging to one square foot of the cave walls—an ingenious way for keeping warm. The city of San Antonio, a local developer, and conservation groups reached agreement on "a $20 million deal" in 2014, to ensure that human development would not encroach on the bats, and that the sky near their cave would remain dark at night. From March to October, the bats at Bracken Cave emerge between 6 and 8 p.m. flying southeast on a collision course with bugs such as cotton bollworth moths and army cut-worm moths being pushed away from crops southwest by winds. 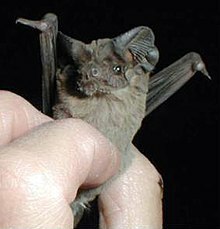 The bats consume several tons of insects per night, which according to research conducted in 2006, saves cotton farmers in south central Texas about $740,000 a year. While the Bracken Cave bat roost is often estimated at 20 million, the true number of bats is unknown due to unreliable counting methods. An animal behavior expert named Leonard Ireland, who researched the bats at Bracken Cave in the 1960s and 1970s, once said the clouds of bats emerging from the cave were up to "30 miles long and 20 miles wide." ^ a b Grove, Noel (December 1988). "Quietly Conserving Nature". National Geographic. 174 (6): 822. ^ "Amazing Bats of Bracken Cave". National Geographic Society. Retrieved 1 March 2013. ^ Page, Eileen (2014-11-01). "In Texas, The World's Biggest Bat Colony Is Saved From City Sprawl". NPR. Retrieved 2014-11-03. ^ a b Salinas, Alex (2013-10-12). "Night Flying Missions vs. Mexican Free-Tailed Bats - Twenty million tiny bats living 11 miles from Randolph pose a giant risk to base aircraft". Torch - US Air Force. Retrieved 2015-05-17. Wikimedia Commons has media related to Bracken Cave. This page was last edited on 4 April 2018, at 02:46 (UTC).